We're off to a good start ... but will it hold? 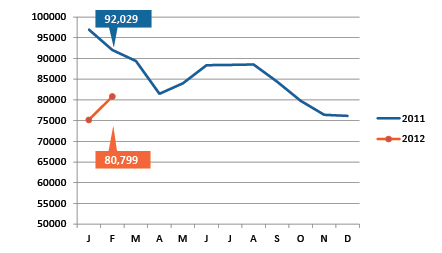 2012 is starting out better than 2011 in terms of our local employment data. Employment is up by more than 13,000 compared to one year ago. Unemployment is down by more than 11,000 and the unemployment rate is also lower, falling from 8.8 percent to 7.7 percent. February's numbers are a little curious, though. Employment dropped from January to February (a sign of weakness) but the labor force increased (a sign of strength). In combination, the unemployment rate shot up by half a percent. Normally, such a dramatic rise in the unemployment rate would indicate an economy in trouble, but we've seen too much forward momentum to suggest that employment growth is actually halting. Instead, we believe the February decline in employment is an anomaly, though we will have to wait and see if the next few months confirm this. 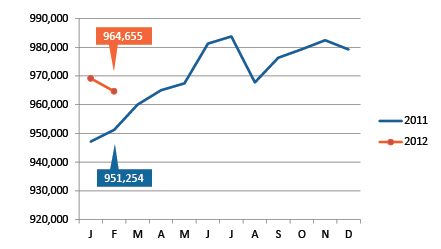 Demand for new employees continues to climb as reflected in the number of job postings. In February, there were nearly 17,000 new help wanted ads in the Kansas City area, an increase of about 3,000 over February 2011. Looking further ahead, the variables we want to focus on are the labor force and employment levels. The unemployment rate, the most-often cited measure of employment health, is likely to be stubborn this year. Remember, our overall employment in the region is still down by more than 50,000 from pre-recession levels. Many of these workers left the labor force entirely as they gave up looking for work. As the labor market improves, more of these discouraged workers are likely to re-enter the labor force. And if the rate of growth in the labor force matches the rate of growth in employment, our unemployment rate could remain unchanged. So keep in mind that the unemployment rate may not tell the whole story. 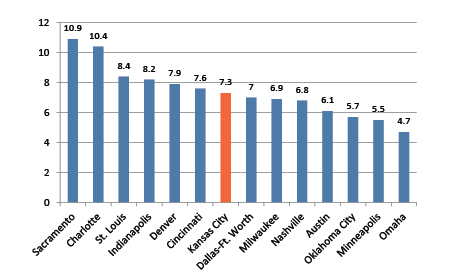 For more employment data, check out our recent blog post about revised 2011 numbers that paint a rosier picture for Kansas City. [Definition: Total persons age 16 and over who worked for pay.] Employment declined from January to February, but even this lower level far exceeds where we were at this point last year. [Definition: Total persons who are not currently employed, but are available for and seeking work.] The decline in employment, coupled with an increase in the labor force, caused a sharp jump in the number of unemployed in February. [Definition: Total of all employed and unemployed persons, as defined above.] The labor force inched up just a bit in February, just above last year's level. [Definition: The number of unemployed as a percent of the total labor force.] 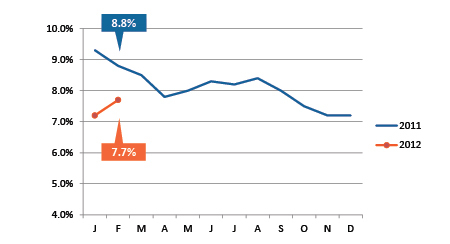 The unemployment rate jumped up to 7.7 percent in February, but is still well below last year's level of 8.8 percent. Of the 42,274 jobs advertised in the Kansas City metro in the last three months, 7,985 or 15 percent were for computer and mathematical occupations. 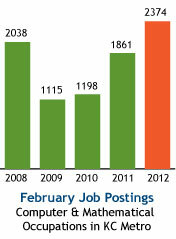 February 2012 had the highest number of new job postings for computer occupations we've seen in four years. In the past week, 292 computer jobs have been posted. If we were able to permanently fill all 292 positions this month, the work performed by these new hires over the next few years would stimulate the creation of an additional 900 area jobs elsewhere in the Kansas City economy and boost its gross regional product by $93 million.